VirtualBox is a free virtual machine developed by Sun Microsystems. This is particularly useful when building kernels and checking that they boot correctly. It is also useful if you wish to switch between operating systems, or have (as happens in so many cases), applications which will only run under Microsoft. 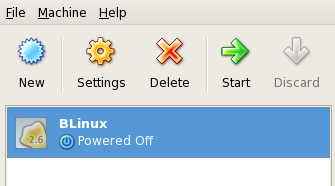 I personally have installed VirtualBox under Mandriva 2009, from the add/remove programs part of the computer configuration. WARNING: The vboxdrv kernel module is not loaded. Either there is no module available for the current kernel (2.6.27.7-desktop586-1mnb) or it failed to load. Please recompile the kernel module and install it by sudo /etc/rc.d/init.d/virtualbox start. This still isn't right - I can now sudo launch VirtualBox from the command line, but it doesn't work from the main menu. There are posts on the internet telling you to make sure that your user is in the correct group to get it to run as a mortal, however, I created the group, and changed the permissions on the application, but failed to get the program to work. I am therefore going onwards as root. Creating a new guest operating system is also very easy - it's all menu driven - select the 'New' button, identify your client operating system, and select the size of the boot disk. This is continued in a different blog entry! Failed to register hard disk - a hard disk with the same UUID or properties is already registered: Make sure you delete / unregister the disk using the Virtual Disk Manager (it's on the file menu) rather than removing the actual file.